A men’s watch had been on my mind for awhile, but I could never find the right one to give my husband. I wanted something that he could wear dressed up for the office or dressed down on the weekends. I also wanted a unique watch that would stand out on his wrist. When I found JORD wood watches, I was immediately impressed with the company’s selection. 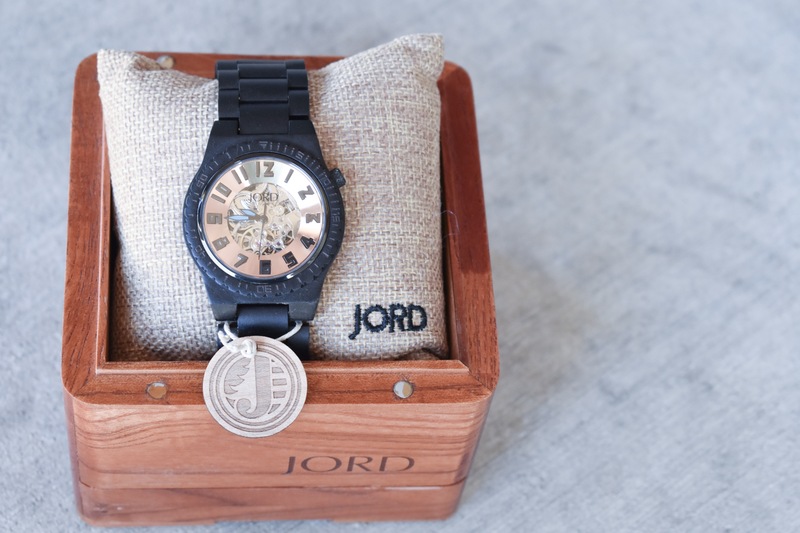 JORD offers several different styles of men’s and women’s watches made from more than 10 different woods. 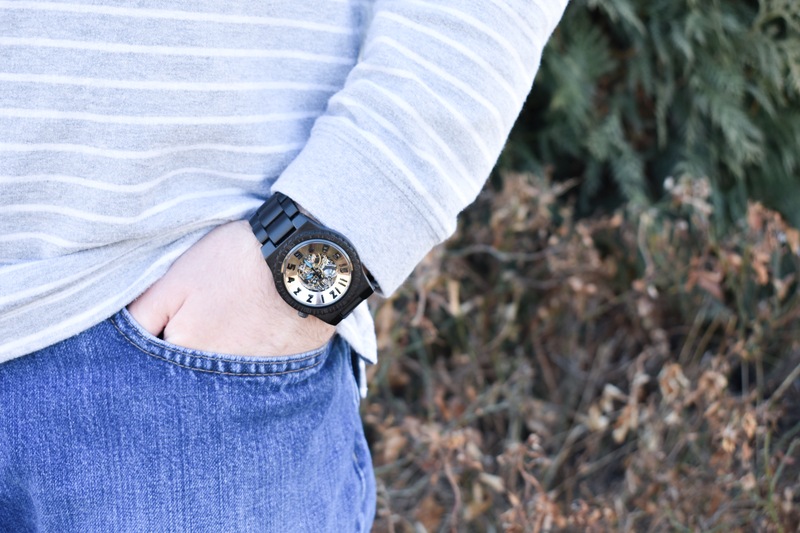 I chose this watch for my husband because of its versatility. It looked like it would go with just about anything that he wore. I think I was right, because my husband has worn his JORD wood watch every day since he got it! Wife win! Colton picked out his own outfit to match his daddy’s: grey and white sweater, blue pants, and boots. He wants to be just like his dada. In fact, he’s even been asking for his own watch since my husband has been wearing one so often! Many of JORD’s watches, including my husband’s, feature self-winding automatic mechanical movements. That means no more trips to the jeweler to get watch batteries replaced! 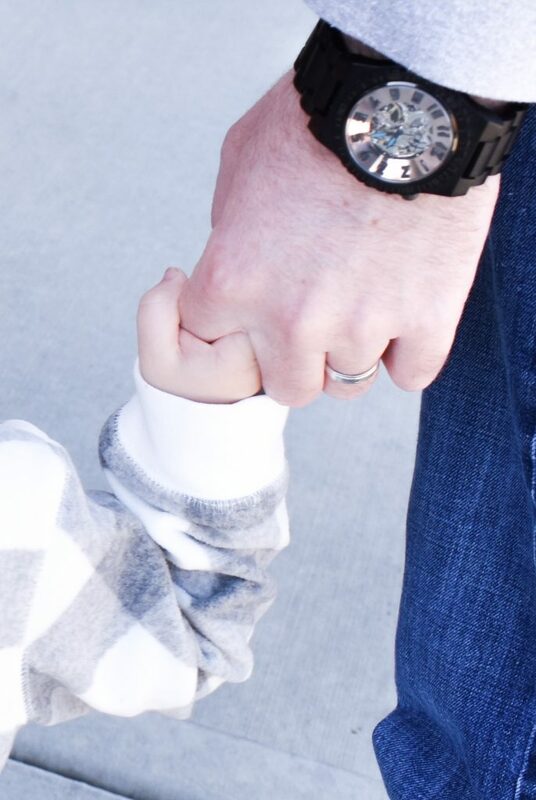 Looking at this picture makes me think maybe I do need to get a tiny watch for that sweet little boy wrist. 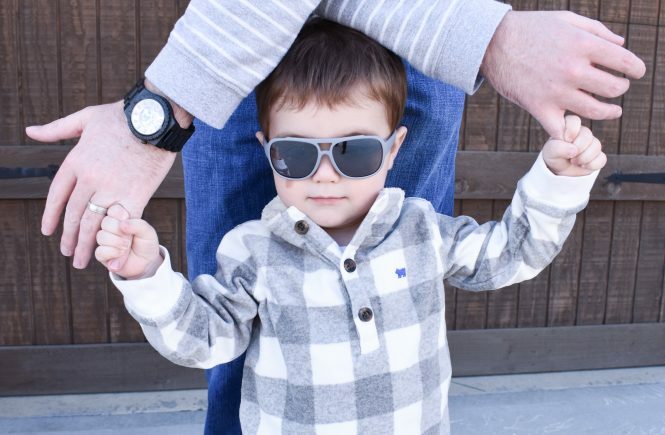 Mamabops and JORD have teamed up to offer $100 off a cool watch from JORD to one lucky reader! 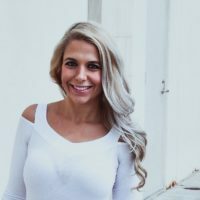 Click here to visit JORD’s website and enter the giveaway. Everyone who enters will receive a coupon code good for $25 off of one of JORD’s unique watches! The giveaway will end on March 19, 2017 at 11:59 p.m. CST and codes will expire on May 31, 2017. In my experience, most guys don’t spend a lot of time decorating their office space. When we were newlyweds, I gave my husband a framed wedding photo to display in his office at work. We had professional family photos taken once our little guy came along, then my husband asked for a framed family photo for his office. He says seeing our faces brightens up his work day (he’s a keeper!). If you don’t have any recent professional family photos, use a snapshot from a vacation or even a selfie. Or, grab a tripod and your camera or smartphone and get a few shots! The memories represented in family photos are by far one of the best gifts for husband’s birthday. My husband absolutely hates running errands. He can’t stand stopping to pick things up on the way home from work, nor does he like fighting weekend crowds. I really don’t blame him! We signed up for Amazon Prime this year and haven’t looked back. I love getting baby essentials like diapers, wipes, and food pouches delivered to our door with free 2-day shipping! In the few months we’ve had Prime, my husband has ordered everything from a stud finder to potato chips. 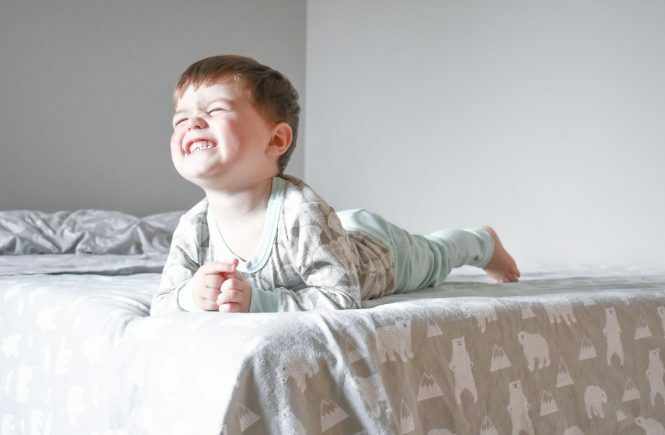 Whenever I mention needing something, his first words are, “Did you look on Amazon?” Visit Amazon to start a free 30-day trial of Prime or gift a 1-year subscription . What man doesn’t enjoy coming home to a delicious home-cooked meal? You can find recipes for beginner to advanced cooks on Pinterest. I have lots of yummy ideas on my boards, if you need some inspiration. [pinterest_profile] If you’re short on time (or cooking ability), pick up a to-go order from one of his favorite restaurants. Set a romantic mood by dimming the lights and adding some candles. 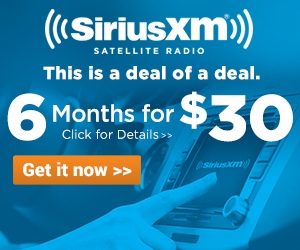 For any husband who has a long commute, sits in traffic, or travels regularly, SiriusXM Radio is a lifesaver. The satellite radio service offers more than 150 different stations spanning music, news, sports, and talk. Many stations have no commercials, which is my favorite part. Plus, no more losing radio signal while traveling! 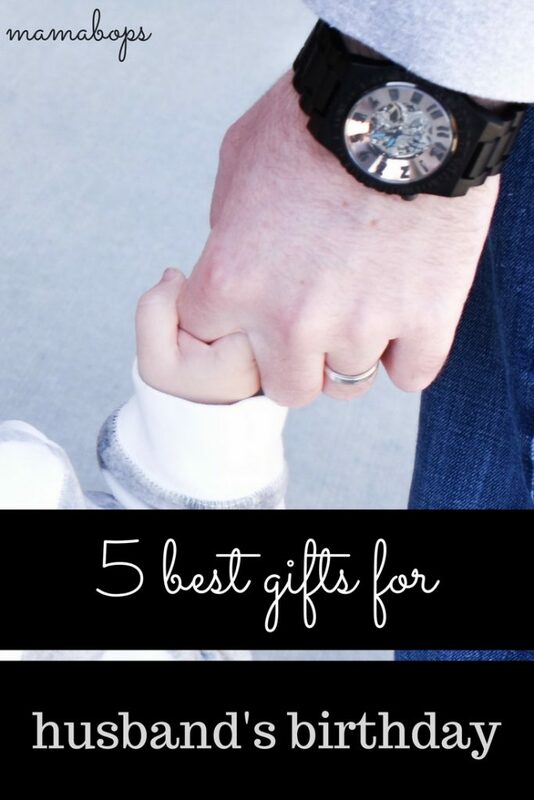 Don’t forget to pin this list of husband birthday gifts for future shopping! What do you think are the best gifts for husband’s birthday? What would you add to this list? These are great ideas! It is almost that time for his birthday over here and I have been trying to think of some clever ideas. A romantic night in is always a good plan! I agree! Sometimes it’s nice to just spend some time at home together! That watch is stunning. I’ve never seen one like that. I wouldn’t have thought about an Amazon prime subscription for my husband, but I definitely like that idea. I will be storing that one for September. Thanks, Becky! My husband really likes his watch. He is also an Amazon Prime addict! It really is a great gift. These are great ideas. I got hubby a pandora subscription so he has no commercials on the app when he listens and he got a smoker for Christmas this year which we’ve already used fifty times since then. Hubbys bday is in May so I have a little time to think of new ideas. I think if hubby wore a watch I’d get him the one you listed. This week is Party #20 which ended last night but look for #21 on Thursday. Thanks for the invite, Patty! I’ll definitely check in on Thursday evening. A smoker is a great gift idea! I bet my hubby would love that one too. My husband would definitely love the watch!! This is an awesome post because I struggle with this too!! Why are men so hard to buy for?! Family photos make the best gifts! After we have photos taken, I’m terrible about actually printing them out! Holidays are always a good reminder to print them out and give some great memories as gifts. I entered. What great ideas! My husband’s birthday is in June, so this is awesome! Thank you, Lynsey! Good luck! Thank you, Belle! I’m very impressed with it! I keep seeing these JORD watches online and thinking how amazing they are. My husband would love them. Thank you, Elizabeth! My husband is very happy with his! Sweet! The JORD Watch is awesome. He will definitely love it. #5! My husband had Sirius when he bought his truck, but then the free trial ran out. He was so bummed! I renewed it as a birthday gift. He really loved it. Great idea to put on the list! That’s a great gift, Tina! I’m sure he loves it! Something he can use every day. I will hqve to try a few… My husband’s birthday is fast approaching. These are great ideas! Thank you! It’s my husbands birthday in a few months (first birthday as husband and wife) as well as our first wedding anniversary! Glad you liked the ideas, Sarah! Happy Anniversary! I absolutely love their watches! I just got the sandalwood and emerald one! That one is beautiful! I bet you love it! Sirius XM! What a great idea, I would never have thought of! Or the data plan to make his truck a hot spot! Thank you!!! The hot spot is a good idea! I hadn’t thought of that! I agree! Glad you liked the ideas! The gift tips are awesome, but I gotta say, my favorite part of the post are those adorable matching outfit pics! Thank you, Elizabeth! I was surprised when they picked out matching outfits. It was pretty cute! 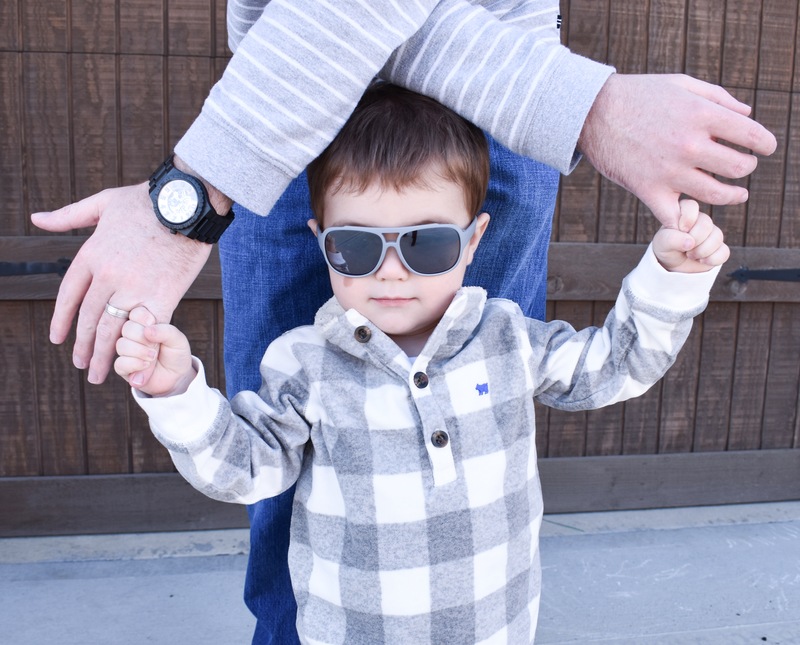 I think my hubs need a Jord watch too – love mine! I do like the Sirius idea – he would love that for his new truck! I don’t have a JORD watch of my own… yet! Hopefully one day 🙂 The satellite radio is addicting. I had to give mine up when I started staying home and I still miss it! I love these ideas! Men can be so hard to buy for! Love the watch! My husband’s birthday is Monday so I’m in a pinch to find something for him! Thanks for the suggestions! Thank you, Jen! Hopefully you found an idea you could use! Happy birthday to your husband! Thank you, Lisa! Glad you like it! Love these ideas! I always find it so hard to gift anything to mu husband so this is definitely helpful! Love the pictures with the little man, so cute. That watch is really nice too. Thanks for sharing! Thank you! 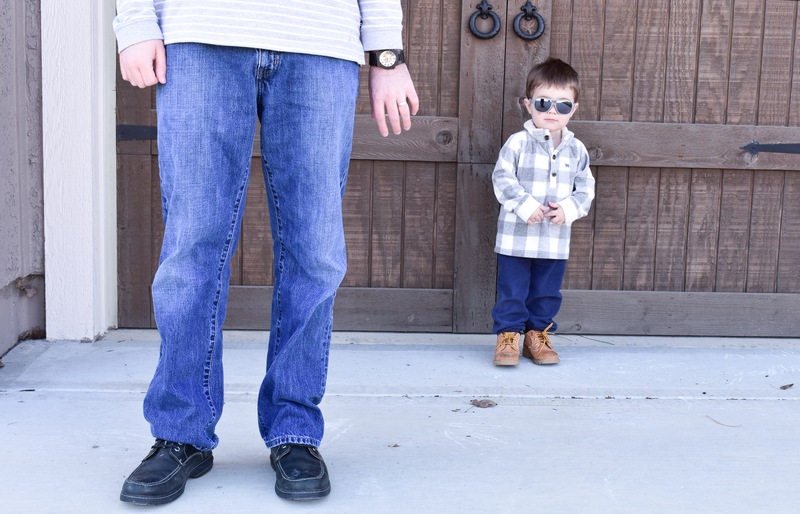 My little guy is definitely a mini-me of my husband! I love photographing them together. Oh good, I’m so glad to hear that! I was trying to have some creative ideas! Thank you! I had no idea what to get my husband for his birthday this year, it was one of the hardest choices that I have ever made. I didn’t even think of getting him a Jord, I mean I love mine, so that should have been a major hint! Maybe next year, right? 🙂 I’d love to have one for myself too! I love this post! I can never figure out what to get my hubby. I usually go with a gift card. These ideas are much better than that!! I’ve given plenty of gift cards! That’s my go-to gift for most people, actually. I’m glad you liked these ideas! Alot of great ideas. Men are usually harder to shop for. I dont know if it is limited stuff or what but I always have a hard time shopping for my husband and boy children. Love Jord watches, just ordered one actually. I also think men are harder to shop for! Hope you enjoy your new watch! Oooh- LOVE the watch. What a great idea! Thank you, Holly! My husband loves it! Great ideas! I always like to get my husband a ticket out to see a sporting event or a show. In the past I have actually called his boss to ask for time off for him for a surprise gift and a getaway! That’s a great idea, Kim! What a fun surprise! My husband’s birthday was yesterday, but will definitely use this for Father’s Day! Yes, these ideas would be great for Father’s Day as well! Happy (late) birthday to your hubby! Glad you found an idea you liked, Kelley! Hope you both enjoy it! Their watches are so beautiful! This is a great list! I got a JORD watch for my hubby last year and he loves it! He gets so many compliments about the watch when ever he wears it. That’s awesome, Tiffany! Great minds think alike! Your husband is a lucky man. You really got him wonderful gifts on his birthday. Well done. Great Ideas! The watch is really unique, I am sure my SO would love one for his birthday. Thank you, Jacqui! My husband loves his watch, so I’m sure your SO would love one too! Thank you, Kayla! JORD makes some truly beautiful watches! I love these gifts! My husband’s birthday is next month, so I’ve begun to think about it, but had no idea. Now I have a bunch, so thank you! Glad you liked the ideas! Hope your husband has a great birthday! Lovely tips for surprise gift.. Thank you so much! Glad you liked the gift ideas! 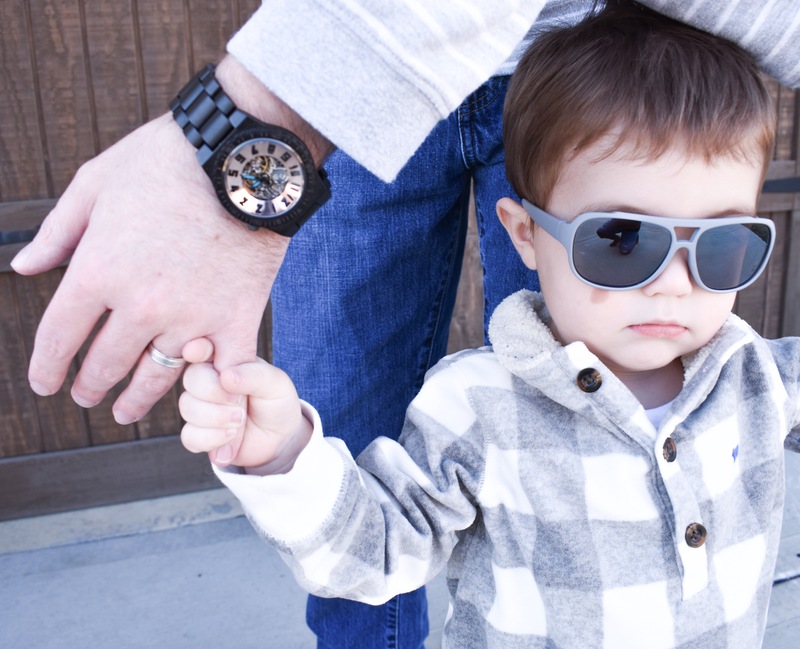 That is a beautiful watch and a very cute little boy! Great ideas!! Thanks so much, Angie! That is very kind of you! 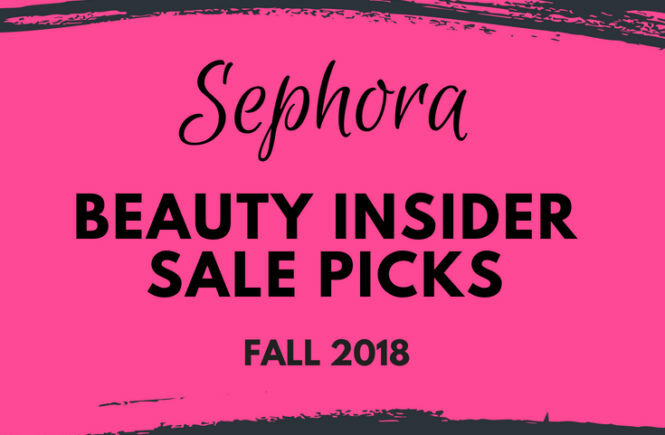 This is a great list of gift ideas! I love my JORD watch, and my husband definitely wishes he had his own.